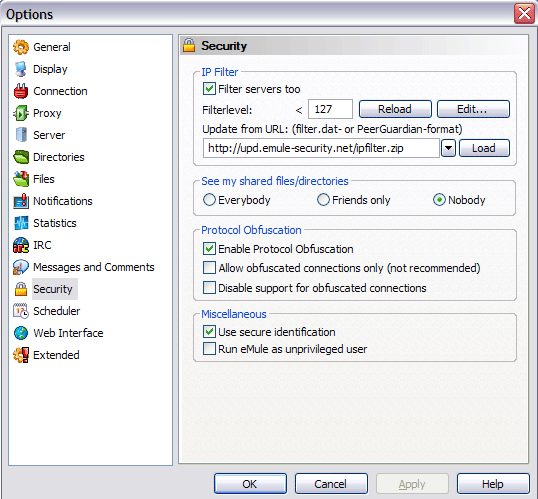 To update IP-filter go to eMule settings -> Security. Copy and paste this link (http://upd.emule-security.org/ipfilter.zip) to "Update from URL:" window. And click to Load button. Also turn on the option "Filter servers too". Notes: If you use eMule 0.42 or older version or eMulePlus MOD, you can download Ip-filter manually from it link. Go to eMule settings -> Security and click Reload button (For eMulePlus MOD, reload the eMule).